chokka blog: Have we paid £8bn more in than we've had out? If you are that confused why not drop into fullfacts.com. Better to right than simply looking to make unfounded allegations. "In each one of the last 33 years, Scotland has paid more in tax per person than the average of the UK." So that's true. e.g. in 2011/2012 Scotland generate 9.9% of UK tax revenues from 8.4% of the UK population. "Over the last five years we have [paid] 8 billion pounds more into the Treasury than we have had out of it, in relative terms. That is 1,500 pounds a head for every man, woman and child in Scotland." The keys is "in relative terms". A simple example would be to imagine the total tax revenue raised in the UK was £100, but the total UK expenditure was £120 (£20 of borrowing). If Scotland contributes say 10% of tax revenues, or £10, it would be reasonable to expect that Scotland would get 10% of expenditure, or £12 to spend. But this isn't what happens, Scotland only gets £11 to spend. So "in relative terms" Scotland has paid in £1 more than it gets back. The difference of £1 being spent in the rUK of course. If you use the real numbers the total of this difference is around £8bn over the last 5 years. In other words if Scotland got a fair share it would have had an additional £8bn to spend over the last 5 years. For example in 2011/2012 Scotland raised 9.9% of tax revenue but only got 9.3% of spend. The same situation has existed for more than 30 years and it may be an important discussion point should there be a Yes vote and the UK debt needs to be divided up. FT - An independent Scotland could also expect to start with healthier state finances than the rest of the UK. Although Scotland enjoys public spending well above the UK average – a source of resentment among some in England, Wales and Northern Ireland – the cost to the Treasury is more than outweighed by oil and gas revenues from Scottish waters. IFS – In contrast to the widely held view that Scotland is a net drain on the UK public purse, the IFS found that, although government spending per person was higher in Scotland than in the UK as a whole, the gap between spending and revenues was lower. To conclude, what Salmond said was factually correct. I’m not sure if he reads your Blog but I note your offer to retract if you have made a mistake. I trust you will be good to your word and shall watch with interest. The £8.5bn number is the difference in % of UK tax revenue that Scotland raised compared to % of UK spending that Scotland receives. If Scotland had received the same % of UK spending as it has contributed in taxes over the past 5 years then it would have received £324.2bn (9.54% of UK total) which is £8.5bn more than the £315.7 (9.29%) that is identified as Scottish expenditure in GERS over that period. 2. As I point out in my post your argument would lead to Scotalnd generating a far higher proprotion of the deficit than our per capita share - is that really what you are arguing we should be doing; that that would be "fair"? Glad to see the corrections accepted. Interesting to see your comments on the debt share. You will be glad to know that work has already been done on the historical share of Scotland's debt. You will also be glad to hear that it was carried out by Brian Ashcroft of the Fraser of Allander Institute (no friend of Independence). His calculations (based on all the available GERS data back to 1980 when the series started) show that Scotland would currently not only be debt free if would actually be in cumulative surplus to the tune of £68bn. In fact the £68bn number assumes we had put the money under the bed and hadn't invested it. Assuming a modest rate of interest over the period the fund would now be in excess of £100bn. Why start in 1980 I hear you ask ? Well for the simple reason that that is when the GERS data set was first collected (instigated by the UK Government to show the Scots how much they were 'subsidised' - great plan that turned out to be). The UK's national debt in 1980 was less than £100bn. Allocating Scotland a share of that to Scotland at that stage makes little difference to the overall numbers as Scotland's share would have been more than paid back by the surpluses Scotland generated in 1980/81 and 1981/82. Its not a question of being in favour or against a higher deficit, its about having the ability to make that decision. The point is that if Scotland ran the same 'deficit as % of tax take' as the UK does then there would have been an extra £8.5bn available in Scotland to either spend, invest (or to use to reduce the deficit % were we independent). You will understand that deficit in absolute terms isn't the issue (if it was then the UK is in a worse position than Greece which runs a lower deficit per head than the UK does). What is important is the extent to which you are able to support that deficit, in other words deficit as a % of tax revenue. Ivan it may have been late when you posted that comment as I'm afraid it makes no sense. We run a deficit (I think we're all agreed on that?). This "extra £8.5bn" you refer to would simply have increased that deficit. To suggest this £8.5bn would enable us to "reduce the deficit were we independent" is - I'm sorry to say - nonsense. All it could possibly do is increase our deficit. If you're arguing we should have spent an extra £8.5bn over the last five years you absolutely are arguing for a higher deficit - and indeed for our share of deficit (and associated debt) to be higher than our per capita share. 1. Historical analysis based on Scotland keeping our geographic share of oil revenue is only of use insofar as it gives us a guide to the *future* (that being what we are voting to affect). 2. The "had Scotland been independent the 1980's" analysis is of little more than academic interest: we are not voting to re-run the 1980s. 3. To perhaps labour the point: if there is a shale gas boom in the South East in the next decade we would expect that to be shared with the rest of us - that's what being in a Union means. 4. As Prof Ashcroft very clearly points out in his article: we are not re-running the 1980's with an independence vote: we are relying on uncertain oil & gas revenues from declining reserves to support an economy that (even if we kept "our oil") runs a higher deficit than rUK (over last 4 years). 5. All of this is before we factor in the damage caused to our economy by independence and the jobs we know would be lost. If Scotland had ran at the same level of Deficit (as % of Tax Take) as the UK over the past 5 years then the amount of money Scotland would have received from Westminster (in public spending)would have been £8.5bn higher. Had Scotland been independent over that period, and has decided to run the same deficit % as the UK has, then Scotland would have borrowed an extra £8.5bn and spent or invested that. (In absolute terms the deficit would have been higher but as a % of Tax Take it would have been the same). Alternatively had we chosen to spend the same amount as we actually did over the past 5 years then we would have run a lower deficit % than the UK (which is what GERS shows). The decision as to which of those 2 choices to make is a political one. The point is that the extra resources would have been there to allow us to make that choice. To put it another way if you put in 10% of the equity into a business, but you only get 9% of the dividends back you would be a bit pissed off. That is the position Scotland is in. (ps I don't run the comments vetting on the BfS site except on my articles). Why is what has happened over the past 30 years important ? 1. In a partnership the value of what each partner (shareholder)has put into the venture is important when it comes to considering how to split the assets and liabilities on exit. 2. Past performance isn't the only determinant of future performance but it is a useful guide. When buying a business I tend to put a lot more weight on how the business has actually performed to date than on what the sales guys tell me is going to happen in the future. 3. The business decision we have to make in September is whether to extend the contract to stay in the Union or to exercise the Break Clause and not renew the contract. What we are doing is deciding whether to take our 100% of shares in Scotland plc (which is what we will have in our hands on 18/9) and trade them in for 8.5% of the equity of UK plc. What we will be buying is a story about how well the UK is going to perform compared to Scotland over the coming decades. In that scenario you need to subject the 'sales pitch' from Westminster to rigorous scrutiny. If the evidence from the past shows that this Scotland has been outperforming the UK and we are expected to believe that all of a sudden that picture is going to change, just at the moment when we would become independent, then we would be right to treat that sales pitch with some scepticism. 4. Moral hazard is important. If advocates of a No vote can spin a tale about the disasters that will follow a Yes vote (as they did in 1979 and again in 1997) and they are never called on it then they will continue to do so and expect to get away with it. 5. If Scotland is going to be such a basket case why are they so keen to hang onto us. Must be 'cos they love us... Aye, Right. Inevitable job losses ? Why do you think that would be the case ? Is there something inherent in large countries (Spain, Italy) that determines that they generate more jobs than smaller countries (Switzerland, Norway). I am of course cherry picking my examples here but I don't think there is any evidence to say that larger countries are better than smaller ones at job generation. If anything smaller countries perform better than larger ones in terms of wealth generation. Ivan's explanation is perfectly clear. I don't think you've fully grasped the situation, read his posts again Kevin! Ivan I continue to extend you the courtesy of publishing your comments: its a shame your Business for Scotland are not so open to challenge. 1. Then you need to go back 307 years ... and if you are arguing for hypothesised debt share that is a very different point than the fallacious "£8.3bn better off" claim this post addresses. Your state "Had Scotland been independent over that period, and has decided to run the same deficit % as the UK has, then Scotland would have borrowed an extra £8.5bn and spent or invested that" . One last time: then we would be responsible for more than our per cpaita share of debt over that period and your argument that we could have been borrowing more to run an even higher deficit and increase our debt burden does not equate to being "better off" and I'm sure you know that. Kevin, Here's the simple way I view the situation. Scotland is paying its population share (approx. 8.4%) of the interest on the UK debt each year NO MATTER WHAT. That would be fair if Scotland paid into the UK pot THE SAME %age share of revenue as the %age share of expenditure it takes out each year INDEPENDENT OF WHAT THAT ANNUAL %AGE FIGURE WAS. The £8.5 billion mentioned by Ivan is money that's already been spent elsewhere in the UK even though Scotland paid the interest on it as part of its annual interest payments over those 5 years. If Westminster had been running things fairly Scotland could simply have paid less interest on the annual debt for each of those 5 years at the expense of rUK (no small change!) OR would've had the £8.5 billion to invest at the expense of rUK. Ivan is only trying to help you understand the data properly Kevin ... a wee apology for your disrespectful remarks towards him wouldn't go amiss! Thank you for clarifying why you're confused by this data. You state "Scotland is paying its population share (approx. 8.4%) of the interest on the UK debt each year NO MATTER WHAT". That's precisely the point - as the table of data in the blog shows: with the actual spend levels over those 5 years we contributed to 8.2% of the deficit (8.4% over 7 years, 8.9% over 9 years). i.e. we contribute our population share to the deficit and pay our population share of it's cost. Again as you can see highlighted in the table of data if we'd spent an additional £8.3bn as suggested by you and Ivan we'd have been responsible for 9.5% of the deficit which is far more than our population share. Kevin, I am not "confused by this data". Ivan and I are not suggesting that Scotland spends an "additional £8.5 billion". That money is what Scotland was denied by Westminster. Your insistence on adding that £8.5 billion to Scotland's deficit unfortunately exhibits a lack of intellect IMO. I'm unsure if you genuinely don't understand the situation fully or just don't want to understand it because the facts don't reveal what you want to see?! I don't have an economics background but I'd like to think I can compare sets of expenditure and revenue data in a relative manner, given that I'm a graduate in mathematics. I fully support Ivan McKee's posts above and repeat that you should read them again. I honestly cringed when I read the passages of text highlighted in yellow above - they are so arithmetically flawed and misleading for your readers! Posting blogs on issues you don't fully grasp is OK if you are willing to learn from your mistakes and listen to experts like Ivan when they try to explain the error of your ways. Ridiculing their judgement in public Kevin just makes you look foolish! Please don't take this post as an insult, it's honestly not meant in that way. I'm full of admiration for the time you spend engaging people in referendum topics via your blog, even if we disagree which outcome is best for Scotland's future! Westminster did not "deny" Scotland £8.5bn. We run a deficit, the UK runs a deficit. Our share of deficit is consistent with our population share based on the spend actually incurred. If we'd "got" another £8.3bn then our share of deficit would be higher than our population share - we'd be running up bigger debts. This is exactly Ivan's argument - that we can afford more per capita debt because we have more per capita tax income. That's like saying a business debt capacity is a function of its turnover not its profit. These figures (and Ivan's figures) hypothesise an independent Scotland from the last 5 years' actual data. To have been able to spend (or "invest") another £8.3bn this hypothesised independent Scotland would have needed to borrow an extra £8.3bn (over and above our per capita share of UK debt ... that we pay our per capita share of interest on). A direct corollary: the figures show us keeping "our" tax ... the only way we'd be "better off" is if our tax take was higher and/or our spend was lower. Ivan is not suggesting either. He's suggesting we could have spent more, incurred a higher deficit and borrowed more. This would clearly not have made us "Better Off" as BfS claims and as I explain over on this post £8.3bn Better Off? You seem obsessed with deficit comparisons Kevin, not the best variable to use for this purpose IMO! Much simpler to compare in terms of revenue and expenditure percentage shares as THESE SHOULD ALWAYS BE EQUAL in the interests of fairness. However, they never have been and (as Ivan reported above)Scotland has consistently suffered since 1980 to the tune of £68 billion PLUS interest! I can see you are stuck in your mind set Kevin so we'll need to leave things there. No hard feelings! The penny will maybe drop with you one day Kevin ... perhaps when you watch Scotland's debt mysteriously reducing after a YES vote in September?! Asserting things in capital letters does not strengthen your argument. The falsehood I am addressing in this post is the last 5 years statement made by both BfS and FM Alex Salmond; so lets leave "time machine" arguments about the 1980's aside. I stand by the post - if you believe "same percentages" is fair then you would need us to spend more, incur an even higher deficit and be responsible for more than our population share of debt. Following that economic policy it would indeed be "mysterious" if our debt was to disappear following a Yes vote. As already pointed out Kevin, I dispute your " ... need us to spend more" claim. However, we've gone full circle so best to sign off now. I just hope your readers are interested enough to scroll down and read all these comments at the bottom before drawing their own conclusions. Otherwise you might've convinced some that Westminster hasn't been systematically screwing Scotland over for decades! In my case your hope has been rewarded, I have read alway down to the end. I know who Ivan McKee is and have read some materials and watched his YouTube videos. 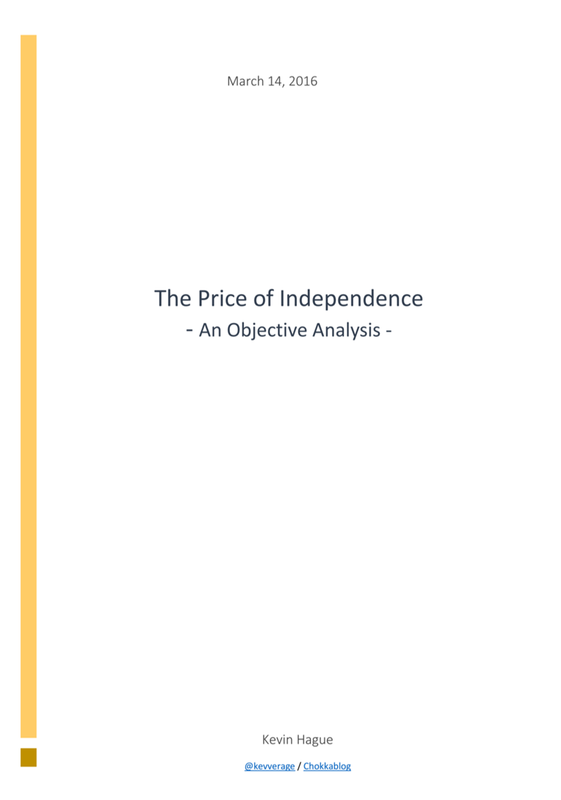 I largely disagree with his arguments,interpretations and analysis of the economic case for an independent Scotland. I know who Kevin Hague is as I have followed his blog and read his bona fides. I find that his arguments, interpretationa and analysis are compelling and accord with the viewpoints I have developed through my own reading around this subject. As to Anonymous. I have no idea whether there is one anonymous or if there are six of you out there. In each post anonymous adopts the position of having superior knowledge without demonstrating any credentials to support this conceit. On that basis I have tended to discount any of your contributions as probably being a BfS plant running interference for Ivan. Your contributions from behind a veil only tend to unddermine Ivan's case in my eyes. I have drawn my own conclusions, can you guess what they are yet? if you eveal yourself I may engage in a debate with you. I am not in favour of shadow boxing. This is not about doubting Ivan's "judgement"; its about understanding his reasoning and showing it up for what it is. Ivan is not arguing that an independent Scotland would have raised more tax in the last 5 years; this analysis shows us keeping all the tax we raised. Ivan is not arguing that we should have spent less money in the last 5 years. Ivan is arguing that we should have run a higher deficit per capita than rUK - he argues this because our tax income per capita is higher than rUK and therefore he argue we have a higher debt capacity. I have pointed out before this is akin to defining a business debt capacity on its turnover rather than its profit. So Ivan argues we should have spent £8.3bn more, run a higher deficit and incurred more debt. This is Ivan's definition of "Better Off". I am very happy to doubt the judgement of a man (or an organisation like Business for Scotland) who puts that on a slide (as shown here that makes the claim we "would have been £8.3bn better off as an independent country". Terry, call me Jimmy Winters if that somehow makes engaging with me more plausible. Kevin, I follow what you're saying very clearly but maintain that your reasoning is flawed. One last time ... Westminster pays off/accrues debt on behalf of the entire UK in our present situation. Scotland is likely to take a population share of that debt of 8.4% after a YES vote (although a historical debt calculation may be more in Scotland's interests). If fairness prevailed at present then Scotland would have the same percentage share of expenditure as revenue, whether we were running at a deficit (like at present) or making a profit. The fact that we receive less of our rightful percentage expenditure implies that rUK must be spending it instead (hence Westminster is denying Scotland that money). In addition, whether that would presently make us run at a greater deficit or not is immaterial, given that the debt will probably be carved up on a population share after a YES vote in any case. If we were independent at present then we would have the choice whether to spend that extra income or use it to pay off some of our debt. Either way the fact remains that Westminster has been denying Scotland its rightful share of expenditure until now, approx £68 billion plus interest according to Ivan McKee! Concentrating on current absolute deficit figures paints a false overall picture and perhaps suggests I'm wanting to have my cake and eat it (because UK is running such a large annual deficit right now). The size of Scotland's relative gain (when UK has an annual deficit) or loss (when UK makes annual profit) in this current UK arrangement is determined purely by how different the percentage share values are for expenditure and revenue. I hope this is clearer Kevin, although I feel as though I'm only repeating myself again. After independence then all your absolute deficit analysis would be relevant as Scotland would have full responsibility and be in control of its entire pot. However, at present we can only work with percentage shares as everything is relative to the UK expenditure and revenue. You state per-capita share of debt but don't seem to get why that should equate to per capita share of deficit. You also fail to grasp the inevitable consequence of what you argue for - I think this really is the alst time. 1. The analysis shows us keeping all out tax revenue. There is no tax revenue "given" to Westminster in these figures. We keep it (including most favourable definition of geographic share of oil). We can't be better off on the income side unless you argue that we raised more tax than these calcs show - you're not arguing that. 2. Spend; you are not arguing that we should have spent less (there are arguments to had there ref Trident etc. but that is a different topic not related to historical "fairness"). 3. Spend: you are in fact arguing we choudl have spent £8.3bn more, run a higher deficit and incurred far more than our per capita share of debt. Your obsession with comparing percentages of different numbers to try and argue we've been hard done by in some way doesn't wash and any poor soul who has read this far will I presume have worked that out for themselves. The explanation provided by those championing that Scotland would have been "£8.3bn better off" is palpbale nonsense - you are simply arguing that we could have run a higher deficit and incurred more debt. That is not better off in any sense. Over the 5 year period the "yes" analysis is correct. Had Scotland received the same per capita level of spend as was contributed in revenue then there would, be an additional £8bn of spend available in Scotland to equate the Scotland share of debt over this period with that of rUK. In that 5 year period Scotland's relative contribution was 0.2% higher than its relative spend - 0.2% of £4trillion UK spend is £8bn. However.......as Kevin's analysis shows, this hypothesis only holds good for that specific 5 year period. Extend it to 7 years and the relative Scottish share of deficit is about the same as rUK and if you shorten it to 4 years then actually Scotland's share of deficit is greater than rUK and Scotland is a net beneficiary. I have no doubt that if you do run this analysis from 1980, that the historic buoyancy of North Sea Oil will mean you find Scotland has "put in more than it took out" in relative terms, but we are in 2014 and the equation is more finely balanced and we have to make judgement calls based on your expectation of the future. One undeniable truth is the volatility of North Sea Oil - this whole debate acutely emphasises that and it's not massively comfortable having that volatility in c.15% of your income. I recognise you are "on my side" - but I'm afraid your statement is not quite correct. Scotland in fact already received a significantly higher expenditure per capita than rUK - the amount that was spent did (almost exactly) mean our share of deficit was the same a rUK - we "got" expenditure which was consistent with us "getting" our per cpaita share of deficit. If we'd have received the same per capita spend we'd have been actually been significantly worse off. I've only recently started reading your excellent blog. This is a very interesting piece and is one of those interpretations peddled to the masses as "truths" that gets spread like wildfire on social media. Like the anonymous poster above, I too am a mathematics graduate. It doesn't make my opinion any more relevant but I would hope it may count for something. Sometimes to logically illustrate a point, you need to change the data to a more extreme example. So for example, to keep the numbers simple, say an alternate universe Scotland has just discovered oil in gargantuan quantities. It has a population of 10% of the UK but now generates 50% of the UK tax take. The UK now has a total tax take of £100m with a total spend of £200m, with an obvious deficit of £100m. This alternate universe Scotland gets allocated £50m with the rest of the UK getting £150m (so that they're getting back the same as they put in). Someone has a think about this and realises "hang on, if we instead got back the same % as we're putting in, we should have got back £100m", and comes to the conclusion that they've been diddled out of £50m (throws hands up in the air and presents this as an argument for independence from the UK). By this logic, had they received this extra money at the expense of the rest of the UK, Scotland alone would be responsible for £50m of the deficit (by % of spending). So 10% of the population responsible for half the deficit. Erm, would this be "fair and socially just" - the rest of the UK would have to sit and watch as one of it's members got fat on the spoils, while the rest can sing for it? Also, this rather simplistic analysis takes no account of any of the history beforehand where in our alternate universe the rest of the UK had, before the gargantuan oil find, allocated 10% of spending to Scotland despite the fact Scotland had only paid 8% of the tax revenue, in the interests of fairness and distributing funds to the parts of the union that needed it most. In our current reality, this situation would not even exist if it wasn't for oil. It's a boon, but by god hasn't it made us very greedy, and by the extension of separatist logic oblivious to being "fair and socially just" with the other 3 partners of the UK. One point of view that never seems to get much traction is:- suppose 90% of the North Sea energy resources were located in the English Geographical area, would there have been an outcry from the "English" that it was "our oil", lets severe the Union and keep it all for England? I doubt no such thing would have happened. Suppose it did though, would Salmond be still calling for Independence, or would he have been decrying the "English" greed as something to be abhorred?